77 users visit the site each day, each viewing 1.10 pages. It has 2 DNS records, ns1.tektonic.net, and ns2.tektonic.net. It is hosted by Global Net Access Llc (Georgia, Atlanta,) using Apache/2 web server. 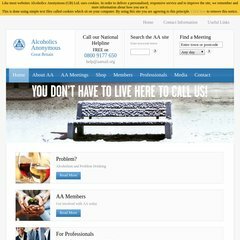 Aa-gb.org.uk's server IP number is 207.210.65.8. PING www. (207.210.65.8) 56(84) bytes of data. A ping speed test response, is timed at 49.2 ms.